The Beatles‘ animated classic Yellow Submarine has been digitally restored for a new Dvd/Blu-Ray release. The 1968 film, which has been out of print for years, will hit stores at the end of May (12). Restoration expert Paul Rutan, Jr. and his team of specialists at Triage Motion Picture Services and Eque Inc. worked on the film for months, cleaning up the film’s photochemical elements by hand, frame by frame. The Dvd and Blu-Ray packages will feature a making-of documentary, the film’s original theatrical trailer, audio commentary by producer John Coates and art director Heinz Edelmann and interviews with others involved with the film. To coincide with the re-release, Candlewick Press bosses will release a new, compact hardcover edition of the Yellow Submarine picture book in April (12). The reworked soundtrack will also hit stores. 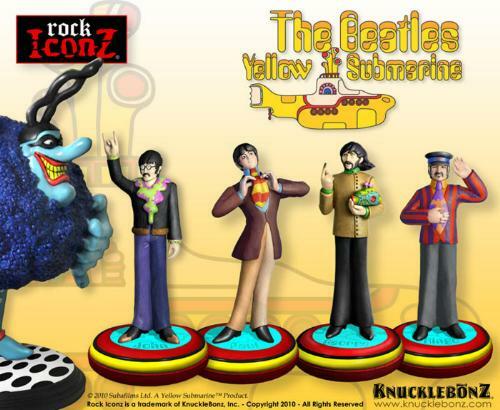 KnuckleBonz® Inc. is excited to unveil a series of limited edition statues in their Rock Iconz® series representing characters from the animated film classic The Beatles, Yellow Submarine. KnuckleBonz is working closely with Apple Corps. Ltd. to create this series. The company creates limited edition statues and these will be highly collectible, with only 3000 of each statue created. These collectibles are licensed and approved by Apple Corps, Ltd. Live Nation Merchandise, Inc. The Beatles North America Licensing Agent brokered the deal. All figures are 1/9 scale (approximately 9″ high), hand-painted, numbered and each comes with a certificate of authenticity. The first release in the series is the “Blue Meanie”, the Yellow Submarine’s arch villain. The “Blue Meanie” by KnuckleBonz is shipping next week from http://www.knucklebonz.com in time for holiday delivery. The “Blue Meanie” Rock Iconz will be very exclusive with only 1968 statues created in this limited edition. KnuckleBonz creates hi-end sculpture that features rock’s most highly influential artists. Dedicated to honoring rocks greatest through master artistry, KnuckleBonz has established the music-based collectible series: Rock Iconz.